Version 13 is a supported version of LANSA. Service Pack 2 (SP2) is the latest service pack for V13. A significant change in LANSA V13 that will impact you is that V13 contains new licensing. When upgrading to V13 (even if your ‘upgrade’ is in fact the installing of a new version), you will be required to obtain new V13 specific licenses for all LANSA software that required licensing at V12 and prior. Both server and client licenses and Hardware keys (Dongles) are included in the re-licensing. New licenses can be obtained in advance in preparation for a V13 upgrade. Prior to upgading to V13, you should send the CPU details of all servers and workstations requiring re-licensing to your LANSA representative for new V13 licenses. Refer to Product Licensing for more details. You MUST check in all objects to the Master IBM i Repository prior to upgrading to Version 13. Failure to do this will set all local objects to not checked out. Upgrading to V13 will set all objects to NOT CHECKED OUT in the Visual LANSA database. This requirement is to support the enhancement to allow an object to be checked out for update to only one PC at a time. Refer to the V13 Readme CCS# 107481 on the V13 DVD for further details of the enhancement. The latest LANSA EPCs that contain fixes and add valuable new features to your LANSA products can be found in the EPCs section of this site. Mapforce 2018 has been released by Altova. LANSA has been actively testing Mapforce 2018 with Composer V6.1. This testing has completed without issue. The status of Mapforce 2018 has been updated to Tested OK by LANSA. This error will occur irrespective of LANSA Client versions or Windows operating systems (after applying the update). Uninstalling the windows update allows the queries to complete successfully with output to Excel. A short-term workaround, if customers don’t want to, or are not in a position to, uninstall the update, is to output to XML and load that XML file into Excel. DCM9999 This BIF is only supported on Microsoft Windows. To overcome this error, you must recompile the failing function in the upgraded LANSA system. Despite this extension of the deadline, Apple have made it clear that this implementation will occur. LANSA recommends including a move to HTTPS and ATS into your longer term plans. This has been confirmed as an OS 7.3 issue and an IBM PTF is available to resolve the issue. The PTF is SI62854. This problem is not exclusive to any particular version of LANSA and can occur on all supported versions of LANSA with the master repository on IBM OS 7.3. The following character set issue, exclusive to IBM i 7.3 operating systems, is caused by an API change in IBM i 7.3. On IBM i 7.3, in a WAM, a text LOB in CCSID 37 is sent as corrupted characters (not transcoded) when using the Internet Explorer browser. Note: In Chrome or Firefox users may experience symptoms of LANSAWEB object being downloaded. The cause of this issue is from changes made in 7.3 to an IBM i’s get attributes API causing failures to retrieve file information (CCSID, timestamps and other properties). There are separate patches available for all LANSA versions supported on 7.3. Please contact your local support team to obtain the appropriate fix for the version of LANSA you are encountering the issue with. Important: You should only request this fix if you are encountering the issue described and only if you are on IBM i 7.3 operating system. Upgrading LANSA Integrator from V13 SP1 to V13 SP2 clears the data area JSMDRTDTA [JSM Direct Configuration] in the <JSMLIB>. As a result, any JSMDirect request will fail. Note: This issue also manifests itself when upgrading LANSA Composer from Version 5 to Version 6. The workaround is to reinstate these values. Contact LANSA support if you need assistance making these changes. LANSA Composer Upgrade on IBM i may restore IFS content to the wrong location if the LANSA Composer system setting Default trading partner linked directory no longer corresponds exactly to the location of the root IFS directory for LANSA Composer content. Refer to LANSA Composer Upgrade on IBM i may restore IFS content to the wrong location for details. MapForce 2016R2 and Mapforce 2016R2SP1 has introduced an ODBC Connection issue that can affect existing maps. Refer to MapForce 2016R2 ODBC Connection issue for details. If LANSA Composer client or server is installed with the option “Install for all user of the machine” but in a non-default location that does not include the words ‘Program Files' in its path, the desktop shortcut to the program icons will not be correct. "C:\ProgramData\Microsoft\Windows\Start Menu\Programs\LANSA\LANSA Composer 6 Client"
This error can occur in both Visual LANSA and LANSA for iSeries. A hotfix is available from LANSA to resolve this issue. Contact your local support team to obtain the fix. 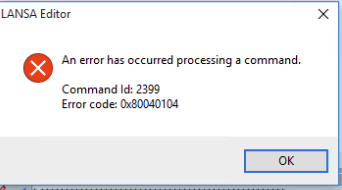 Clicking on the Design tab in the WAM editor can generate the following error. A hotfix is available from LANSA to resolve this issue. If you experience problems with opening the design view of the WAM editor in Visual LANSA after upgrading to Windows 10, please contact your local support team to obtain the fix. A utility is available from LANSA to allow Visual LANSA to be used with Windows 10. If you experience problems with Visual LANSA after upgrading to Windows 10, please contact your local support team to obtain the fix. The LANSA Composer installation on IBM i servers now supports installation into independent auxiliary storage pools (IASP), if required. This statement is not correct; the LANSA Composer 5.0 install does not support installing directly into independent auxiliary storage pools (IASP). Manual steps are available from your local LANSA support group if an IASP LANSA Composer installation is required. A LANSA Composer 5.0 hotfix is available to fix an issue that can cause performance issues in V5.0 on a Windows server. Some LANSA Composer database indices were not created in a LANSA Composer version 5.0 Windows server installation. This leads to poor responsiveness in parts of the LANSA Composer application, and in particular, the database housekeeping (especially the log purge) can take longer than expected to complete. Please ask your LANSA Composer supplier for Hotfix 004 for LANSA Composer version 5.0. After upgrading to V13 SP2, loss of browselist data when the LANSA Web job reaches HTML timeout and the LANSA Web Job is no longer active can occur in webevent applications executing on the IBM i data application server. Technically speaking, when HTML timeout is reached, browselist data is transferred for reuse. In V13 SP2, this transfer is not occurring. Under the situation where the Web Job is no longer running (for example, transaction monitor cleanup due to system setting of reuse 1), the new Web job is not able to retrieve the browelist data from the previous Web job. Users under this situation will encounter loss or corruption of browselist data. Update: A fix for this issue is available in EPC132900 for V13 SP2. Refer to the LANSA for the Web EPCs page for details. After upgrading to IBM i 7.2 or installing LANSA V13 SP2 on IBM i 7.2, LANSA for the web/WAMs will not execute correctly with CGIConvMode Binary set. This problem is introduced in 7.2. A PTF is available from IBM to correct the issue. You should download and apply PTF SI54023 for 7.2. Reminder: In V13 and above, CGIConvMode BINARY is a mandatory setting in the HTTP Server Configuration for LANSAWEB CGI. Refer to CGIConvMode BINARY setting required for LANSAWEB CGI for a full description on how to set this correctly. Altova MapForce versions 2015 has been tested with LANSA Composer version 5.0. A hotfix for LANSA Composer version 5.0 will be required in order to prepare maps (existing or new) with MapForce 2015 installed. Please ask your LANSA Composer supplier for Hotfix 003 for LANSA Composer version 5.0. MapForce 2015 is unsupported with LANSA Composer version 4. LANSA Composer version 4 users should not upgrade to MapForce 2015 unless they first upgrade to LANSA Composer version 5. After upgrading to V13 SP2, deleting a record in a file when executing in superserver mode, causes the application to fail unexpectedly with the following error. PRR0083: Fatal error when attempting to convert <Field name > from client to server or server to client format. There a hotfix available at SP2 level to resolve this issue. This hotfix can be requested from your local LANSA support group. Note: All client side functions/forms that call the OAM in superserver mode need to be recompiled after applying this hotfix. V13 and above, CGIConvMode BINARY is a mandatory setting in the HTTP Server Configuration for LANSAWEB CGI. After upgrading to V13 SP2, ensure that your HTTP Server configuration has CGIConvMode BINARY set for the LANSAWEB CGI. The upgrade process will not manipulate your existing apache configuration to include this setting. Failure to do will lead to unexpected web execution behaviour. Refer to CGIConvMode BINARY setting required for LANSAWEB CGI for a full description on how to set this correctly. Using LANSA Open for .NET V3.6 to connect to LANSA V13 will generate an exception after upgrading the server to SP2. The error on connection is "Unexpected record received"
This connection error is introduced because of superserver changes in V13 SP2 that also affect LANSA Open for .NET. The solution is to download and install LANSA Open for .NET V3.7 from the LANSA web site. After installing V13 SP2 or upgrading to V13 SP2, some pages may display a blank page without any messages. This is due to the use of deprecated Content-Types when posting during web execution. In V13 SP2, LANSA has enforced the use of specific valid Content-Types. You have two options to get past this situation. Refer to Valid HTML Content-Type to use when POSTing during web execution for a full description of the issue. After installing V13 SP2 or upgrading to V13 SP2, even though you elected to not enable 64-bit mode during the install, you may still encounter failures when building deployment packages indicating 64-bit DLLs cannot be copied. To get past this situation, you should delete the X_WIN64 folder from the LANSA Root directory. For example, if your LANSA folder is C:\program files\lansa\x_win64, you can delete the x_win64 folder. Note: If you elected to enable 64-bit mode during the LANSA install, you should not delete the X_WIN64 folder. With V13 SP2, it is now mandatory to have 64-bit of JAVA on a 64-bit PC in order to use LANSA Integrator. There are implications for the V13 SP2 install and upgrade. Refer to You must have 64-bit JAVA to run JSM on a 64-bit PC. After installing V13 SP2, you can encounter issues in LANSA Integrator Studio when creating services for JSMDirect and JSMProxy. This is caused by missing files after installing V13 SP2 LANSA Integrator. Refer to Missing LANSA Integrator files in V13 SP2 for details and the solution. When using the MIS deployment model in V13 SP2, uninstalling a Patch, in a specific circumstance, will not restore the data in the table to the expected contents. Refer to Depending on options selected when deploying file changes via patch, the data may not be restored after uninstalling the patch. Backwards Compatibility Note: Prior to LANSA V13 SP2 when exporting, frameworks and groups were only exported if at least one VL component was exported and "Omit Frameworks and Groups" was NO. Now they are exported purely according to the value specified for "Omit Frameworks and Groups". Refer to Exporting and Importing in the V13 SP2 iSeries User Guide. A recent update (11.0.7) of Adobe Reader introduces problems when using the Adobe ActiveX reader in LANSA applications. LANSA is aware of the issue and is investigating how we can assist LANSA users to overcome this incompatibility. Refer to the following Technical Note for details and possible workarounds. Latest update to Adobe Reader causes ActiveX errors in LANSA applications. After upgrading to V13 SP1, you may experiece either corruption or incorrect translation of special characters in non-english LANSA systems. A patch can be requested from your local LANSA support group to correct this issue. Refer to Incorrect translation of special characters in LANSA for the Web applications in V13 SP1 for full details. LANSA Composer 5.0 cannot be installed on iOS V5R4. CPD0043 Keyword AUT not valid for this command. A keyword was specified on a command that has no corresponding parameter. CPF0001 Error found on CPY command. The same import problem does not occur when initializing LANSA Composer 5.0 on IBM supported Operating Systems. New LANSA Composer server licenses required for version 5.0. Due to changes in the licensing implementation, all LANSA Composer customers upgrading from LANSA Composer version 4.0 must request and obtain new LANSA Composer server licenses before upgrading to LANSA Composer version 5.0. Prior to upgrading to Version 5.0, you should send your CPU details to LANSA Licensing for new Version 5.0 licenses. - Appendix B: License LANSA Composer in the LANSA Composer Guide. LANSA Composer Windows Server installation requires Microsoft Visual C++ 2008 Redistributables. Successful installation of the LANSA Composer Windows Server requires that the Microsoft Visual C++ 2008 redistributable files are already installed on the server. The 2008 version of Visual C++ redistributables is not installed automatically by LANSA Composer setup. If necessary, you should install it before beginning the LANSA Composer Windows Server installation. The Microsoft Visual C++ 2008 redistributables installer is provided on the LANSA Composer installation media in folder \WINSERVER\Installs\VC2008_Redist. One of the recent Chrome browser updates (version 34) has introduced some changes that affect Weblets running inside VLF Web. It will be most noticeable with the STD_BUTTON_V2 Weblet (regular WAM button), which will cease to work - pressing the button will have no effect. This only appears to affect VLF Web, not regular WAMs. However since the upgrading of chrome generally happens automatically, it has the potential to affect many users. Hotfixes for both V12 SP1 (EPC870) and V13 SP1 (EPC130100) versions of the VLF have been produced. If you are experiencing problems after upgrading Chrome, please contact your local support team to obtain the appropriate hotfix. After upgrading to V13 SP1 & EPC131100, LANSA for the Web applications can encounter various symptoms related to incorrect behaviour and unexpected data. - Error message "Unable to add dropdown definition..." when populating dropdown lists in *webevent functions. - Error message MCH3601 “Pointer not set for location referenced” when switching between RDML and RDMLX *webevent functions. - RDMLX webevent functions fail to close all open files on exit from LANSA. This can, for example, prevent library list manipulation having an effect which in turn can cause unexpected data to be displayed on the browser. This problem will be corrected in V13 SP2. In the meantime, a patch is available for V13 SP1 at EPC131100 level to correct the underlying cause of these issues. After upgrading to V13 SP1 & EPC131100, if you experience these or any other unexpected symptoms in your LANSA for the Web application, you should contact your local LANSA support team for the fix. Note: Even if you don't encounter any of the symptoms above or any other similar symptoms in your LANSA for the Web application after upgrading to V13 SP1 & EPC131100, you should request and apply this patch to your LANSA system. Altova MapForce version 2014 has been tested with LANSA Composer version 4.0 and we have now added this to our list of supported Altova Mapforce versions. When using LANSA Composer 4.0 with Altova MapForce version 2014, Hotfix 005 is required. Please ask your LANSA Composer supplier for Hotfix 005 for LANSA Composer version 4.0. EPC131300 introduces a new service ExcelService to read and write xlsx files. This service uses the open source Apache POI 3.1.0 classes so a specific set of jar files are required for running the excel service. These jar files are built to version JDK 5.0 and are shipped as extra to the standard LANSA Integrator (JDK 1.4) build. A zip file with the jar files can be obtained from your local LANSA support group or downloaded from this tip Overview of ExcelService commands. After applying EPC131100 to Visual LANSA V13 SP1, to edit an editable grid cell, you need to click into the grid cell twice. Previously you could just click or tab into the grid cell and start typing. This is an unintended change of behaviour introduced by the EPC and a hotfix is available from your local LANSA support group to resolve this issue. LANSA Client V13 SP1 GA does not support Crystal Reports 2011. This support status is listed in the V13 Supported Platforms document. Support for Crystal Reports 2011 is being reviewed for future implementation. Altova MapForce versions 2013R2 and 2013R2SP2 have been tested with LANSA Composer version 4.0 but require a hotfix. Please ask your LANSA Composer supplier for Hotfix 005 for LANSA Composer version 4.0. Users, particularly those using IBM i servers, should also be aware of the issue described at MapForce 2013 Release 2 changes behaviour for text output files when using IBM i as server and be prepared to modify any affected maps accordingly before re-preparing them. (Note: Altova MapForce version 2013R2SP1 was not tested). When initializing a partition for web on LANSA for iSeries, either during a new LANSA for iSeries install or when creating a partition after install, the import of the graphical variables (*SAVF GRAFVAR) will not complete. Unless you check the spool file for the import, you may not know that the import has failed to complete. It may not be until you attempt to execute a LANSA for the web application that you encounter problems. A new GRAFVAR save file is available that can be moved to the LANSA Program library so the LANSA for the web partition initialization can complete. Contact your local LANSA support team for the save file. After creating and compiling a new process and function(s) on Visual LANSA, when you execute the process, the function icons are missing. Existing processes and functions will execute as normal unless they are recompiled. Recompiling process will also cause the same problem. This issue has been addressed and a hotfix is available from your local LANSA support team. Note that Version 13.0 iSeries Exports cannot be imported to V13.0 SP1. This only affects exports from V13, not previous versions of LANSA. This change has been imposed in V13 SP1 due to modifying Import handling of file library names & long names/identifiers. ## Version 13.0 Exports cannot be imported to this system. Multiple problems on mobile devices in particular after upgrading from iOS 5 to iOS 6. Add touch support for desktop browsers running on touch screens + IE10 event model. LANSA recommends all customers who wish to use mobile devices apply this patch which is available from your local LANSA representative. Note: This is an RDML only issue. When a function is called via its process, and the process runs in interpretive mode, it was not returning to the caller. This issue can manifest itself in various ways and the error encountered may not clearly identify the issue. If you encounter unexpected LANSA for iSeries V13 RDML behaviour when a function is called via its process, then this issue should be considered as a possibility. This problem will be corrected in V13 SP1. In the meantime, a workaround is to recompile the process. A patch is available from your local LANSA representative if you require an immediate correction for this problem. The option to 'Override File Library to Partition data library' during import into Visual LANSA doesn't work as expected for all situations. Refer to Using the option to Override File Library to Partition data library in Visual LANSA for further details. Key(s) of the last Access Route can be dropped after checkin. A V13 issue has been reported whereby, on occasions, access route keys can be dropped during checkin of an RDMLX file to the master repository. In a V13 partition, open a file definition that has access routes. Click the Access Routes tab. For any access route defined, expand the Key, and you will see the keys. Check the file into the IBM i master. Enter the LANSA system on the IBM i master, take option 21=Access Routes and take option 2 to see the access routes definitions. In some situations, you may find the key has disappeared. Note: if there are multiple access routes on a file, the key(s) for each access route will be missing. Checking out again, you will get an error when pressing Save/Compile due to the missing key. This problem has been exposed by compiler optimisation changes in V13. This issue will be corrected in the next EPC for V13. A patch is available from your local LANSA representative if you require an immediate correction for this problem. A defect has been discovered where it is possible to create lower or mixed case physical file and logical view names that are not supported on IBM i (IBM i does not support these if the file name length is < 9 characters). Either at compile time or execution time, error SQL0204 (file not found) may occur. LANSA has addressed this issue by creating a patch that affects compilation of these files and code generation for SELECT_SQL. When building or accessing these files the Identifier will be used rather than the lower or mixed case name. This fix will be available in the next V13 EPC. LANSA strongly recommends all customers who have an RDMLX partition enabled for Long Names apply this patch which is available from your local LANSA representative. Visual LANSA and Visual LANSA Framework V13 applications have a support status of Uncertified when run in DirectX mode (XRNDR argument of X or M) on Windows XP. Refer to the V13 Supported Platforms document for further details. The V13 install on Windows can encounter an issue with LConnect.zip failing to unzip during the install (or repair or upgrade). This can happen if the lcolist.exe service is locked. For example, in some instances, a process called HD-Agent.exe had a lock on lcolist.exe. This is part of an Android Emulator called BlueStacks. You may need to uninstall the listener service from the command line (lcolist –u) and reboot to release the lock prior to re-attempting your upgrade or install. LANSA is investigating why this Android emulator locks the lcolist.exe. There have been instances of the following message being issued during a Visual LANSA V13 install on a supported Operating System. One possible scenario that can cause this message to be issued is if you start an install, cancel out of it and restart the install. If you encounter this message during the Visual LANSA install on a supported Operating System, contact LANSA support for instructions to overcome this. V13 requires new licenses across all LANSA V13 products and features. You can prepare for V13 by sending in an upgrade license request in advance of installing V13. Refer to the License Planner in Product Licensing for details..
Hardware Key upgrade request email issue. This situation existed in previous versions but may be encountered more by users because of the need to upgrade their Hardware key to V13. Some email Clients do not interact correctly with the Hardware Key License request email functionality. - Select the Save All button. The request will be saved on your local hard drive. Note the location of the saved text file in the generated message. Add the text file to an email and send it to your local LANSA representative. For development slave installations, you MUSTcheck in all objects currently checked out for update prior to upgrading to LANSA Version 13 to ensure the future integrity of updates. This is required due to changes implemented in LANSA Version 13 to ensure only a single developer is able to check out and make changes to repository objects. V13 requires SQL Server 2008 R2 Express Edition at the latest service pack. If you do not have the latest service pack already applied to SQL Server 2008 Express, you can download it from Microsofts web site. Navigate to the download centre https://www.microsoft.com/en-us/download/default.aspx and search for SQL Server 2008. You are only licensed to use the Microsoft SQL Server 2012 Express Edition database software installed by Visual LANSA in conjunction with a Visual LANSA development seat. You must not deploy an application that uses the Microsoft SQL Server 2012 Express Edition database software without a separate license from Microsoft. When installing Visual LANSA network client installations, if performance of the IDE is sluggish, this can be caused your your anti-virus software. Adding the network path to the Exclusion list can cause the IDE to be much faster. MSI Installs require Windows Installer version 4.0 or later. This may mean that it must be manually installed on Windows XP before deploying a V13 app. RDMLX support of Unicode fields will not include DISPLAY, REQUEST and POP_UP commands. This means that V13 will only support Unicode fields for presentation in Web pages for WAMs only, not RDMLX *webevent functions. RDMLX support of long names will not include fields and lists used on DISPLAY, REQUEST and POP_UP commands. This means that V13 will not support long names in *webevent pages for all fields and lists. VL development supported on Windows 7 only, not XP or Vista. WAM development supports minimum IE8 (shipped with Windows 7). All Visual LANSA EXE and DLLs are now digitally signed. This identifies the author of the objects as being published by LANSA, aids in identifying modification of the objects and also ensures cleaner usage of Sysinternals tools like ListDLLs v3.1 which adds a new option designed to aid in malware hunting that filters output to include only unsigned DLLs. Check out the file and its fields that have the SUNI attribute. Create an impact list that contains the fields and all objects that use them. Save it to Excel. Delete the fields from the repository. Reload the file. It should now only have Nchar/Nvarchar fields, hopefully with the same identifier as previously. Rebuild the OAM. Use the impact list to rebuild and test affected objects. * IBM i Char/Varchar fields with CCSID 1208 will always be loaded as Nchar/Nvarchar. Override of File library on Windows requires OAMs to be re-built in 13.0 and for Functions and Components to be built with Visual LANSA 11.5 or later. Many Visual LANSA components e.g. Forms (Prim_Form) and Tree View Item (Prim_TVIT), were originally designed to use only repository enrolled icons (Prim_ICON). However, with PNG (Portable Network Graphic) becoming the norm, it has been necessary to change the class of the Image and Icon properties for a number of different primitive classes to support Bitmaps (Prim_BMP) as well. For example, the icon property of Form (Prim_FORM) now inherits from base graphic (Prim_FLBX) and can use both repository enrolled Icons (Prim_ICON) and Bitmaps (Prim_BMP). Similarly, the ImageXxxxx properties found on Tree Item (Prim_TVIT) have also be changed. For most situations, this will be of little consequence. However, in scenarios where the icon is used programmatically and a specific class of image is expected, it is possible that the upgrade to v13 will result in syntax errors. To counter this issue, the user will need to change the target variable so that it too is defined as a base graphic (Prim_FLBX) or if this is not possible, cast the image to the appropriate class. Security control - the VCS security controls what you can change in the VCS. What you change in your local repository effects nobody else. Only when you need to check it in to your VCS does there need to be a security check. (Removing this meant we did not have to deal with securing the security records in the text format VCS files). VCS uses YAML to serialize a LANSA Object into a textual representation. Its been chosen because it’s a documented file standard and is easy to use with difference tools, which may be fundamental to the use of a VCS. Its is also easy to edit by hand. Once the partition is enabled for long names support, all new files will have the PF created with SQL on the IBM i (as they automatically get the enable long names flag enabled). This can be switched off for individual files if needed. Quick Export is not available for Web Components. Web Components will not be able to be saved to a VCS using the IDE. They can still be in the Repository, but you must manage them yourselves. The versioning information in the WAM is for use whilst editing the WAM. This is recognised in the fact that the number of versions kept is specific to each IDE instance. This feature will still be available when there is a VCS Master. But, when the file is serialised this information will not be kept. It will not be checked into the VCS Master. The saving of the object serialises it into the YML file. Whilst the YML file will not contain the WAM versions, neither will it remove them from the LANSA Repository. When a GetLatestVersion is performed, only then will the YML file replace the WAM versions with the single current instance. This is consistent with the rest of the LANSA objects. The VCS does source code control, not the LANSA editor. Similarly, the VCS performs security checks, not LANSA. Enter F11 twice then page down to find Product Option 39, which should have the description "International Components for Unicode"
Multilingual descriptors are now stored in UTF-8 in V13. Nchar fields are visible on LANSA Client, but are not supported. Customers using LANSA Client should not change existing fields to Nchar if they want to access those fields via LANSA Client. It is safe to add Nchar fields to existing files, but those fields will not be accessible via LANSA Client. Nchar fields are invisible to LANSA Open for now. Customers using LANSA Open should not change existing fields to Nchar if they want to access those fields via LANSA Open. It is safe to add Nchar fields to existing files, but those fields will not be accessible via LANSA Open. LANSA for iSeries Import now requires that duplicate Alternate Names be forced or not. When import is executed either via command LANSA IMPORT ... or call LANSA IMPORT, PARM10 positions 11-13 requires 'YES' for duplicate Alternate Names to be forced. The default is for Alternate Names to not be forced, in which case the existence in the importing partition of a duplicate Alternate Name for a different object to that being imported will cause the whole import not to proceed. LANSA for iSeries Import will now produce a second report - the Export Contents Report. Instead of showing the entire contents of the export, this will be produced to show any duplicate alternate names that are in the export, or that no duplicate alternate names have been found there. LANSA files with Binary or Varbinary fields now use the native types Binary and Varbinary on IBM i. This is reflected in the OAM code, so if the OAM is rebuilt, the table must also be rebuilt, so the OAM and PFs/LFs have the same native field types. WAM output is now in UTF-8. Text entered in the WAM Editor (UTF-8) no longer goes through any character set conversion (The intermediate character set conversions limited the use of certain characters that couldn't be converted to EBCDIC on IBM I ). jQuery Core, jQuery UI and jQuery UI Timepicker libraries have been updated to versions 1.7.2, 1.8.2 and 1.0.1 respectively. LANSA has changed the images path to these third party library files. They are automatically used by WAMs as they are shipped as external resources. If you have WAM static pages, they will need to be recreated or manually updated. Web jobs will only log user profile changes when there is an actual user profile change. If the web request is for the current user profile, the job's user profile is not reset, but the environment is reset (library list and other user profile settings) as the previous request may have made changes to the environment.